The recovery indicators were hit hard last month last month, with two of them falling below the levels at the start of the last recession. Those levels were the readings of these indicators for December 2007. 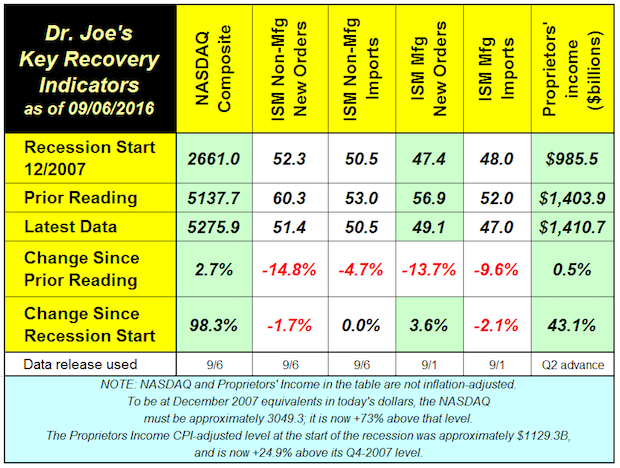 The ISM reports have not been good. In the manufacturing report, all of the components of the index were down compared to the prior month, but they are also down compared to last year. Compared to the recovery indicators report for September 2015, manufacturing new orders are down -5.0% and imports are down -8.7%, and the same categories for non-manufacturing are down -18.9% and -1.9% respectively. Overall, the ISM Manufacturing report was bad, but is finally in line with other reports such as durable goods orders and factory shipments, which have been weak or contracting for more than 18 months. Every component in the ISM manufacturing report had a negative change, with some falling below the breakeven of 50, which means that those components are declining. Employment was one of those, as it contracted for the second month. In the non-manufacturing report, eight of the ten components decreased, but employment is still mildly positive in that sector. Proprietors income, which is a quarterly release but revised monthly was $1,410.2 billion for the second quarter, raised slightly to $1,410.7. It will be revised one more time at the end of September. Proprietors income is one of the better indicators of the health of small business. GDP for the third quarter is likely to be +3%, the result of an inventory rebound from the second quarter. In the long run, real GDP without the bouncing inventories is still in the +2% range, but recent data, and especially these ISM reports, raise a caution flag. Last week's employment report will be covered more extensively in the next “Mondays with Dr. Joe.” The report was not very good, but there was a notable shift from part time to full time workers. This may mean that employers will not be adding more workers in upcoming months, but may be increasing their hours.